In this article, I wish to give a glance at some of the best IAS coaching center in New Delhi. Each and every IAS coaching center in New Delhi endeavor to grant IAS coaching in an excellent way. Normally, all the coaching classes include subjects like logic thinking, reasoning aptitude, general knowledge, day to day happenings which have an impact on the society, up to date undertakings in the nation, political changes, main modules, and preliminary subjects, and papers associated with all regional languages of India, etc. 1. Analog IAS Institute - Various branches in Bengaluru, Vishakapatnam, Guntur, New Delhi. The students get classes through guest lecturing and motivational classes which are normally given by retired IAS officers, senior officers, etc. They highly offer a full-time course for all the exams like prelims, main exam as well as to handle the personal interview. The classes are taken in various modes like guest lectures and motivational classes from retiring public servant & distinguished experts. Apart from full-time coaching classes, there are weekend batches also available with highly qualified professionals of New Delhi. Through Online, the candidates can appear for mock tests, solving of previous years question papers, crash course, e-magazines, IAS planner, etc. 2. Unique Shiksha IAS Institute - The most significant and exclusive IAS coaching institute in India, applies learning methodology and provides extra attention in the key areas like annual study plan, personal mentors, recorded classes, customized course options so that they can meet and satisfy individual needs and preferences. All faculty members are highly qualified, and the ambiance is too good with library facilities and too with an uninterrupted internet connection, incorporated preliminary tests and main tests, all-time internet access so that the candidates can refer from online in case of queries to be clarified. The mission of Unique Shiksha IAS Institute is to make the aspirants fully trained to face the toughest IAS exam through proper guidance and good studying environment. Every time they come out with unique teaching ideologies so that the candidates can get eagerness in the learning process. It has its branches in different areas in and around Delhi say, GTB Nagar, Pusa Road, RDC Raj Nagar, Preet Vihar, Sector-14. 3. Vajiram and Ravi IAS Coaching - The courses offered in Vajiram and Ravi IAS Coaching center are Commerce, Sociology, History, Public Administration, Economics, Psychology, etc. This institute provides coaching for all three levels, Due to outstanding performance, the aspirants who are interested in IAS coaching can prefer online registration process to make it more simple and convenient. It guides the students through more regular tests, visual aids, video conferencing and lectures, etc. The retired civil servant officers pay interest in taking the class. This is the exclusive part of Vajiram and Ravi IAS Coaching Institute when we compare to other IAS coaching center in New Delhi. 4. Classic IAS Academy - Classic IAS Academy recommends a special curriculum for all the papers for the main exam and also anthropology, public administration, general studies, etc. It has been offering the candidates to pursue their goals and catering them for the preliminary test, main exam as well as training for the personal interview in the English language. At regular intervals, they conduct workshops, seminars, conferences to enhance their students. Finally, they go for reviewing the performances and results. Classic IAS Academy furthermore prides yourself on of faculty team that takes account of researchers, professors and added self-motivated individuals in the midst of tremendous accomplishment of goals. All classrooms working out is well thought-out in an approach to keep an eye on every candidate's growth. 5. Rau’s IAS Study Circle - It is one of the best IAS coaching centers in New Delhi, filled with highly qualified trainers of both academics side as well as resource persons as research scholars. The subjects you can see here are Economics, political science, Geography, History, environmental science, General Studies, Administration, Biology, Ecology, etc. The specialty of this coaching center is imparting knowledge to the students through case studies, advice from experts, senior IAS officers, etc. They highly concentrate on the candidate’s individual attention so that they won’t allow many aspirants to get admitted in a single batch. It is inimitable and possesses an ongoing process of the mentorship program. This institute put in order for communication with senior IAS officers. They furnish the candidates with advice and carve up their work knowledge, skill to the aspirants those who are qualified for the IAS exam. 6. Alternative Learning System IAS Academy - One of the best IAS Coaching center in New Delhi with highly dedicated teaching faculty members. The faculty members are highly experienced say for more than ten to fifteen years of experience in taking IAS coaching classes. They have a high ambition to make their students in getting enormous knowledge in all aspects like anthropology, general studies, political science, administration, regional languages, ecology, biology, etc. ALS offers a unique learning methodology comprises with seminars, conferences, workshops, self-study, self-evaluation, periodic test, writing skills and the special classroom learning with excellent study materials. 7. Shriram IAS Academy - In Shriram IAS Academy, the candidates are so hopeful and put an effort, hard work, enthusiasm, and perseverance which ultimately help to accomplish victory in their examination. It has thirty years of experience in running the IAS Academy. It is fully professionalized and dedicated faculty members make the aspirants prepare for IAS exam preparation. It guides the students through more regular tests, visual aids, video conferencing and lectures, etc. It has made enormous steps more than years on condition that learning process with the uppermost excellence and in the motto of budding emerging cream of the crop i.e upcoming IAS officers. 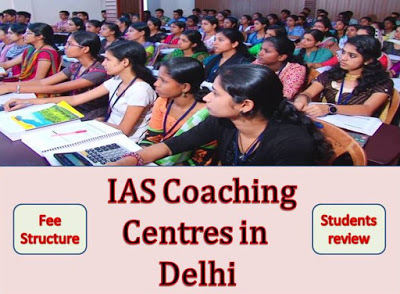 In addition to the above IAS Coaching centre, there are other centre who are also offering massive benefits for those who are in dream to get through IAS exam like Chanakya IAS Academy, Ensemble IAS Academy, Pabulum IAS, ALS Karol Bagh, KSG IAS Academy, SPOTON Logistics, Guidance IAS Institute, Vrinda IAS Academy, Direction Institute for IAS exam etc, what's more endeavor at providing vast training for the aspirant who yearn to attend the coaching classes for IAS exam and wish to get position as dedicated IAS officer, India.